Coupons are a great way to save money, especially in these tight economic times. But what do you do when you need something unusual and don't have a coupon, or you buy a product regularly and don't always have the right coupon. The internet comes to the rescue -- websites offer searchable databases of coupons online, free coupons, printable coupons and store promotion codes. Printed Coupon Books - a book of coupons for purchase with coupons for local restaurants, grocery stores, car care centers, etc. (for example the Entertainment Book). Direct Mailers - many of the direct mail coupon providers offer coupons online. Clipping Services - for a fee, online services will clip coupons and send them to you. Online Coupons - a number of websites provide databases of free printable coupons and promotion codes. 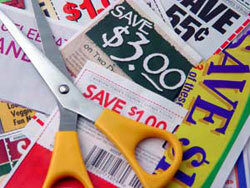 If you are buying a printed coupon book or buying coupons from a clipping service, a bit of thought is required. It may seem counter-intuitive, but when you compare the cost and savings, these coupon sources often make sense. Be Cautious Online - don't give your credit card information to a website that seems questionable. Don't spend a lot on a first purchase from a source you do not trust. There are some unscrupulous folks out there, but with a little bit of care they can be avoided. Expiration Dates - be sure you understand the expiration date of the coupons before you buy them. Restrictions - be sure you understand all coupon restrictions. Coupon Trading - many libraries and community centers have set up coupon trading clubs. If your area doesn't have one, you could consider setting it up. Coupon Organizers - the most efficient coupon clippers come to the store with alphabetically organized coupons in specially designed coupon organizers. The online sites can be great source for printable coupons, free coupons and promotion codes. All you need is a bit of research, some math and some common sense. Then let the savings roll in!